Transformation of Birmingham’s Mailbox, designed by Stanton Williams, will shortly begin on site following the appointment of Galliford Try as contractors for the scheme. Works on the building are planned for completion in 2015. Originally completed in 1970, Mailbox was converted into one of the largest mixed use buildings in the UK in 2001, with 16,000sqm of commercial office space (including the British Broadcasting Corporation), two hotels and over 9,000sqm of retail space. An existing public route, with twenty-four hour access, runs through the heart of the building, linking Birmingham’s city centre directly to the cafes and bars on Salvage Wharf across a 17m change in level. 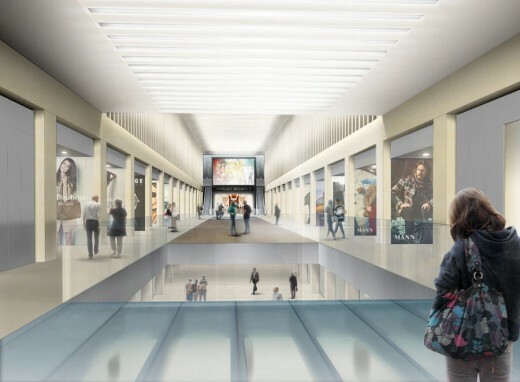 The transformation requires significant alterations to the interior of the existing building, with the removal of large parts of the existing structure to create a new 70m long “Urban Room,” which is designed to function as an internal public space, capable of hosting various events, exhibitions and other social activities – a new type of social meeting place, which also provides a focus for the retail and office areas. 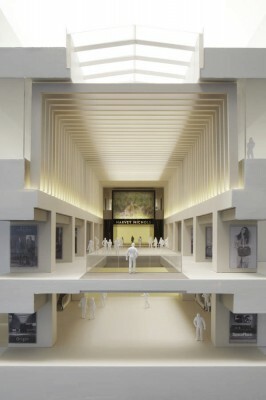 The internal promenade, connected through a series of double-height volumes, is characterised by high-quality natural materials and diffused daylight, which enters the building through a series of fins spanning below the glazed skylight. On the internal elevations the fins fold down to screen views between office and retail areas. The calm interior is intended to act as a foil to displays and installations and as a framework to support events. 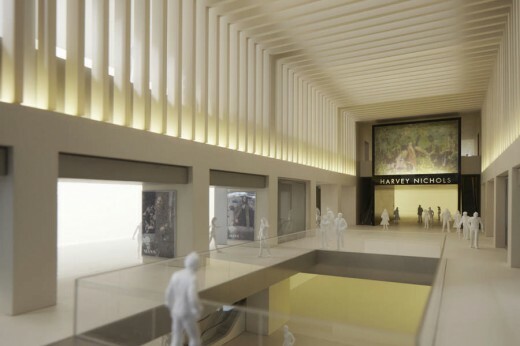 The character and proportions of the space encourage the route through the building to be experienced as an opportunity to pause and engage with the activities within the building, whilst retaining a strong connection with the public realm of the city centre. Completed projects include: the new campus for the University of the Arts London at King’s Cross, the Stirling Prize-winning Sainsbury Laboratory in the University of Cambridge’s Botanic Garden, the Britten Pears Archive in Aldeburgh, the Hackney Marshes Centre and the Eton Manor site for the London 2012 Olympics. Current projects include: King’s Cross Square, the Grand Musée d’Art in Nantes, an art centre for Lincoln College in Oxford, masterplan for the Judge Business School in Cambridge, a research building for Great Ormond Street Hospital, the Royal Opera House ‘Open Up Project’, a student residential building at King’s Cross and a number of high-end residential projects in Central London. The Mailbox is Birmingham’s premier shopping and lifestyle destination with exclusive stores, waterside restaurants, cafe bars, hotels, office accommodation and 24 hour secure parking. Established in 2002, Milligan is a retail developer that specialises in the Strategic Repositioning of retail centres in an increasingly competitive and challenging retail environment. and delivered by focusing on the needs and desires of the people who will visit, use and enjoy the space. In twelve years, Milligan has developed an international reputation for approaching retail assets with flexibility and flair. Development projects include a wide variety of Shopping Centres in addition to the development of Markets and the strategic repositioning and development of the retailing offer in Airports. These projects have been principally located in the UK although Milligan has also been an active developer in Spain and Portugal. Notwithstanding the very real challenges in each of these retail markets, every Milligan project has been profitable. Galliford Try plc is a leading UK housebuilding and construction group. It is listed on the London Stock Exchange and a member of the FTSE 250. The construction business carries out building and infrastructure work across the UK with clients ranging from major Government departments through to regulated utilities and private sector companies. Recent projects within the Birmingham area include the Edgbaston cricket ground redevelopment, Hotel La Tour, the ongoing Birmingham Dental Hospital, Resorts World at the NEC and the Extra Care retirement villages at Hagley Road and Bournville. At the end of the last financial year to 30 June 2013, the Group generated revenues of £1.5 billion.